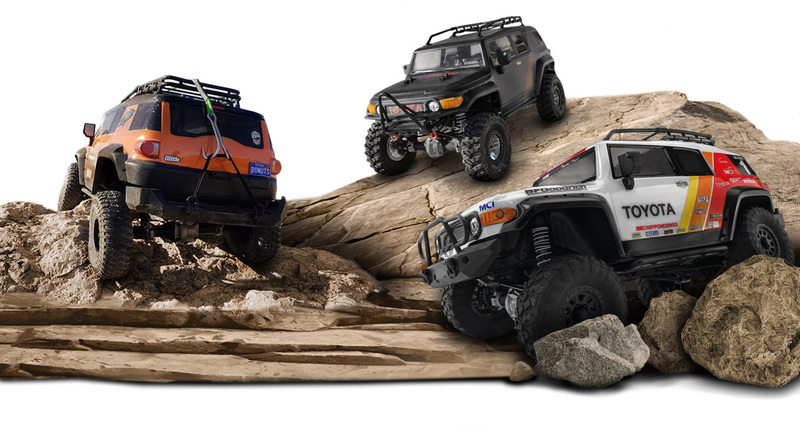 The Venture is the ultimate adventure-ready scale RC trail truck, and now it's available in a build-it-yourself version, ready for you to completely customize into your ultimate off-road vehicle. Developed from the ground up to be the most advanced and driver-friendly scaler truck available, the Venture is the perfect trail companion for anyone from weekend ramblers to globe-trotting adventure heroes! Whether you're driving up a mountain, crossing rocky streams or just taking it on a trail drive, the Venture can handle it all. To make the Venture the best in class scale truck, the chassis features a formed steel chassis that encloses a realistic front-motor position with an all metal-gear transmission and full-time 4WD drivetrain with a central transfer case, plus a scale suspension featuring dual stage, oil-filled, coil-over shocks and sturdy off-road axles with full-time locked differentials. 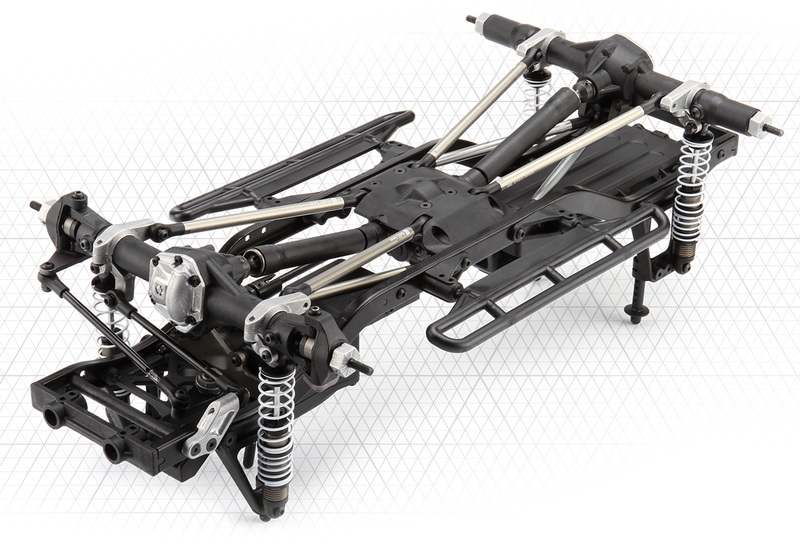 The build-it-yourself Venture SBK includes official HPI options such as rebuildable front universal driveshafts, aluminum lower links for confidence over rough terrain, 4-link rear for increased articulation and traction, plus hidden axle weights for increased stability with a lowered center of gravity (CG). As you assemble the kit from the fully detailed assembly instructions, you can modify the truck if you wish, or add extra options and accessories as you go. The Venture Scale Builder Kit is supplied in kit form only, ready for your own choice of motor, servo, speed controller, wheels, tires, body, and bumpers, so YOU can instantly have the most customized truck possible. Are you looking for the pre-built and Ready To Run (RTR) version of the Venture? Check out the #118146 Matte Black, #116558 Gunmetal, or #117165 Sandstorm RTR Venture trucks! The Venture rock crawler features a formed steel C-channel chassis with sturdy plastic cross braces as the foundation for a realistic scale truck chassis. To make sure the truck has a front weight bias that improves its climbing ability, the motor and transmission are mounted right up front - just like in a real truck! For additional weight up front, the steering servo is also mounted to the chassis next to the motor. The Venture scale crawler truck is packed with features already (you can read all about them below), and the SBK version includes a selection of hand-picked options that will make it even more capable not just on the trail, but also through the most difficult terrain. If you already have a Venture, all of these options are also available separately to enhance and strengthen your truck. #115942 Front Universal Driveshafts - these are stronger than the standard dogbones, and are also completely rebuildable for when you need to perform routine maintenance. They'll also increase the steering angle for easier turning around obstacles. #116442 Aluminum Lower Links - machined from 6mm thick aluminum alloy and then anodized to match the shock bodies and motor plate, these burly metal links help stiffen the suspension and allow the dual-stage shocks to do their duties to the utmost. #117079 4-Link Rear - adding extra articulation to the rear axle gives extra grip at critical moments, such as when side-hilling up steep embankments, giving you the confidence to take the Venture to the extreme limits of scale crawler performance. 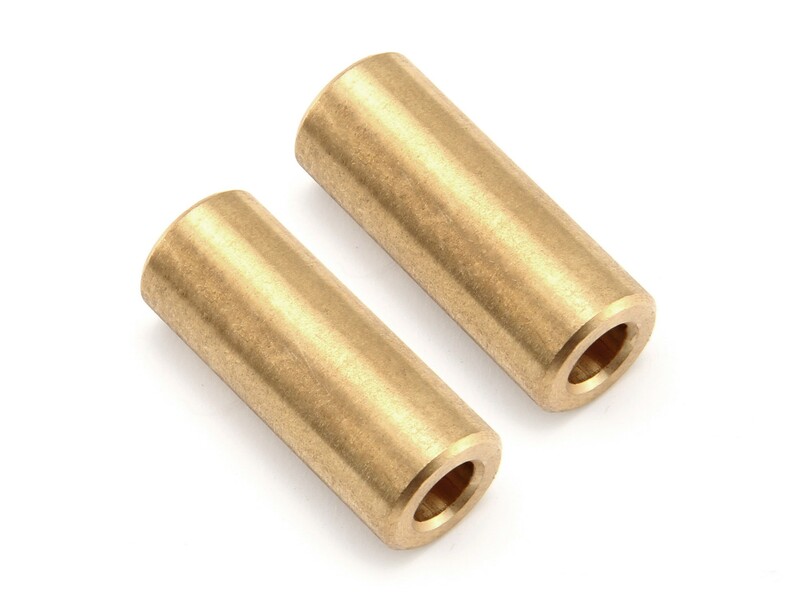 #117086 Axle Weights - adding 24g of weight to the inside of each axle, these heavy brass weights are not only hidden from view for scale realism, they add even more stability to the truck by moving the center of gravity as low as possible. The chassis layout of the Venture, with the forward-mounted motor and transmission, plus the chassis-mounted servo (CMS), puts most of the weight at the front end, giving the Venture ultra-realistic driving performance and an advantage over most other scale trucks when hitting the trail. The Venture is the first scale truck to feature strong metal gears throughout its transmission. With a main gear set taken from the ultra-fast and ultra-strong Savage XS Flux, the Venture drivetrain can handle LiPo power up to 3S, as well as brushless motor power with zero upgrades. With the transmission drive ratio of 1.53:1, the overall drivetrain ratio is 7.6:1 for a good all-around gearing and a final drive ratio of 30.4:1 out of the box. This will get you up or down most trails and get you started climbing difficult inclines. With pinion gears of 15-28 teeth, you can get final drive ratios of 30.4:1 to 16.2:1. You can easily alter the ratio with an optional 56-tooth spur and pinion gears from 19-32 teeth for final drive ratios of 22.4:1 to 13.3:1. In addition to the motor and transmission at the front, the Venture features a centrally mounted transfer case with a gear ratio of 1.5:1. Whilst putting the maximum amount of weight to the front of the chassis, the central location of the transfer case allows the drivetrain to sit low and down the centerline of the chassis so the driveshafts are perpendicular to the axles for maximum power transfer to the tires. 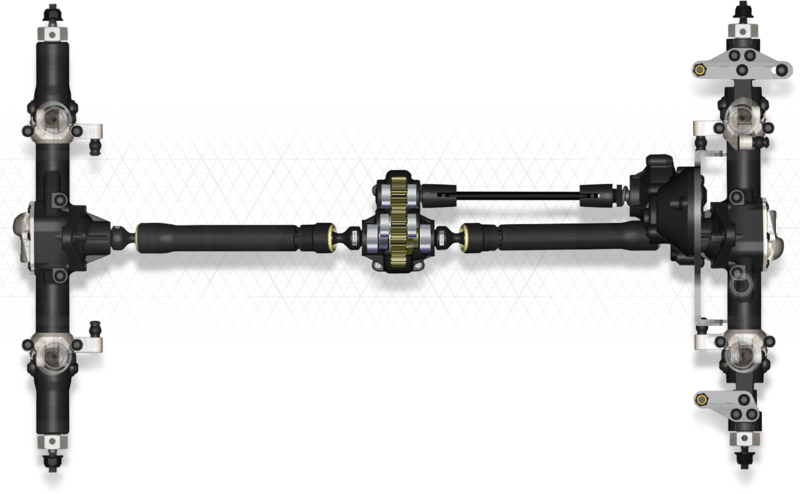 The low angle and central position of the driveshafts allows for maximum power transfer, so as much power as possible reaches the tires. 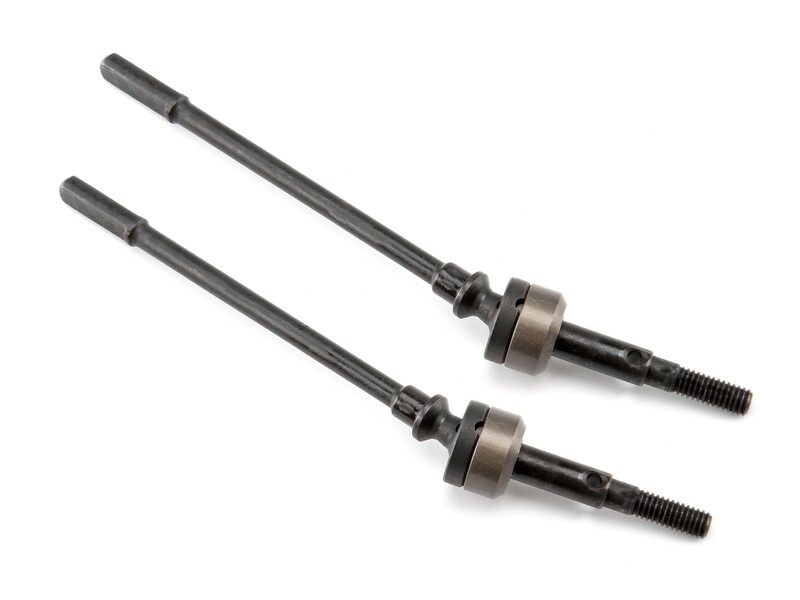 The driveshafts are equal length front and rear and feature composite slider-style shafts with metal universal joints at each end, where they meet the transfer case and axle. At the axles, 13-tooth pinions and 43-tooth ring gears (axle ratio of 3.31:1) sit inside the "pumpkin" or center of the axles. Each differential is equipped with metal diff lockers for pure 4WD traction at all times. An externally adjustable slipper lets you tackle slick rocks and loose surfaces without having to make big changes to the setup of the Venture. Correct adjustment gives you the perfect amount of power and grip by reducing wheelspin - and the easy to reach adjustment nut lets you make quick adjustments on the workbench or out on the trail. The steering system for scale RC trucks is very important - and that's why the Venture was designed with the latest advancements in steering and suspension for strength as well as realism. This makes the Venture the most versatile scaler truck on the trail! With a Chassis-Mounted Servo (CMS) and Behind The Axle (BTA) steering, plus a functional Panhard bar, you get perfect scale looks with realistic and ideal performance, no matter what terrain you're hitting. Aluminum mounts for the Panhard bar and aluminum steering plates add the strength and durability to give you total confidence on the trail. A Panhard bar on aluminum mounts provides extra scale looks, because it's featured on most off-road trucks and vehicles. The purpose of the Panhard bar is to maintain zero bump steer as the axle rises over bumps and falls into holes and ruts. This helps the Venture go exactly where you want it with precise steering control! The realistic steering for the Venture chassis begins with a Chassis-Mounted Servo. With any standard-size servo firmly mounted at the front of the chassis, the weight of the servo aids the front weight bias of the Venture. The solid metal steering link also looks like it came out of a real truck, and connects to the tough steering knuckle. The Venture SBK will fit any standard size steering servo - choose your best one for your needs! For a super-tight turning radius, the Venture features zero Ackermann steering angle. This basically means you have equal steering angles for the front tires when they are steered all the way to the left or right - the maximum amount of steering for the best performance when tackling rugged off-road terrain. The Venture features Behind The Axle (BTA) steering linkage out of the box, so you don't have to do any complicated modifications to get maximum performance on the trail. A thick steel rod connects the two metal-reinforced steering knuckles together behind the front axle. With all of the steering linkage kept out of the way of potential obstacles such as rocks and roots, the truck has a much better approach angle than with standard RC crawler kit steering designs. Good suspension is at the heart of every off-road vehicle, and this principle is evident everywhere you look on the Venture chassis. 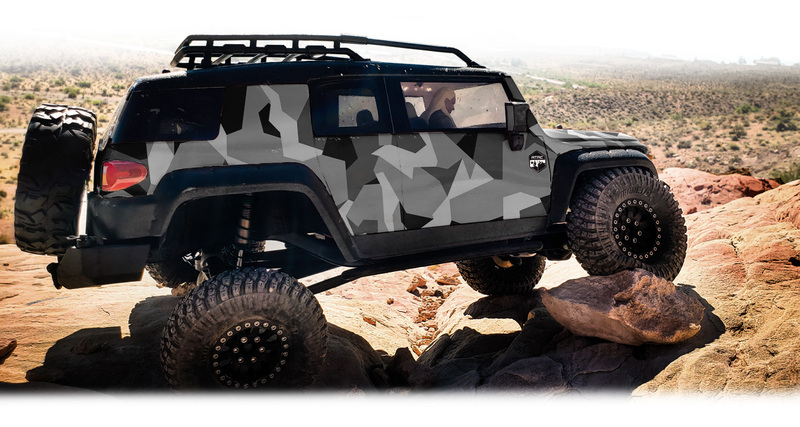 From the aluminum mounts on the axles to the dual-stage shock absorbers, the Venture is packed with advanced features unseen on other scale crawlers - without purchasing optional parts! The Venture can perform on any trail, thanks to adjustable oil-filled shock absorbers and standard-sized 12mm hex hubs to fit a huge range of scale wheels and tires. 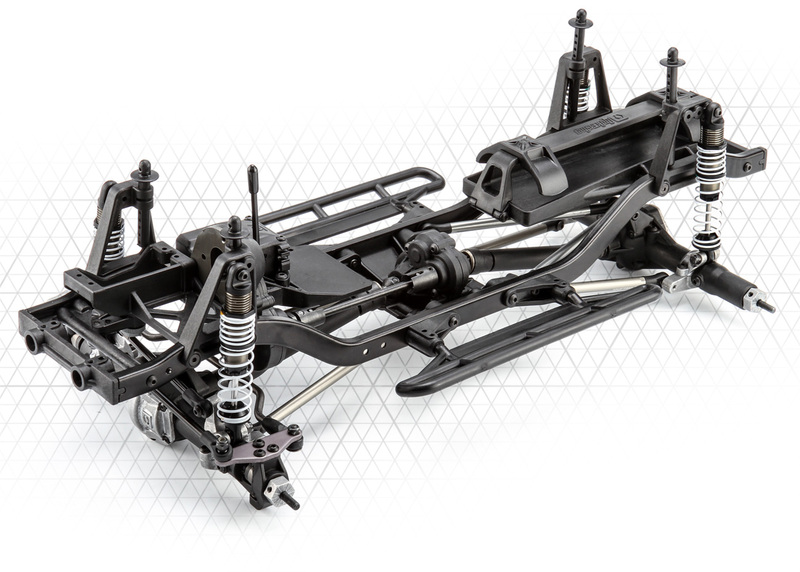 Enhancing the look and style of the Venture chassis are aluminum suspension parts that are a fantastic throwback to truck kits from RC's retro golden age. From the axle covers which have the HPI hex logo on them, to the thick shock and rod link mounts, the real metal parts add a great look to the Venture that other scale trucks can't match! Both Panhard bar mounts are also aluminum, as well as all four hex hubs for the wheels. Each hex hub is also held in place on the axles by steel setscrews for additional security. The Venture SBK features a sturdy and reliable 3-link suspension front and a highly articulated 4-link suspension at the rear. 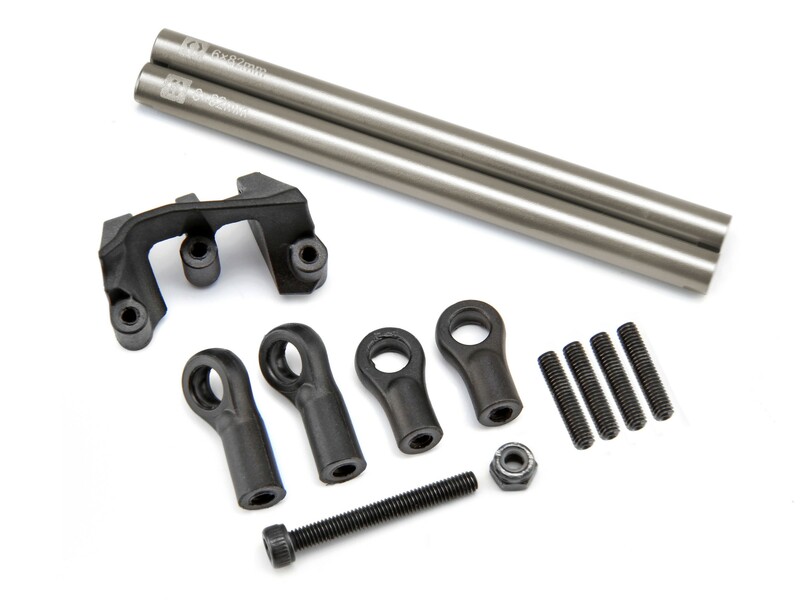 6mm aluminum rod links form the lower suspension links front and rear. The upper links consist of a single aluminum single link for the front, and 2 aluminum upper links at the rear. For ultimate trail tuning, the alloy shock absorbers feature dual-stage shock springs. This means the short spring softens the gentle bumps and dips you encounter while driving, and the longer firm spring catches the harder hits, such as when the Venture is descending a steep embankment. HPI designers have found the perfect combination of springs and oils for all-around driving, but you can fine-tune the ride of your truck with different shock oils and springs to make the Venture perform at its best on the trail. The Venture chassis lets you change the wheelbase from 290mm to 315mm (11.4 to 12.2 inches) by modifying the length of the linkage, which can change the look and driving of the truck. If you fit a different body to customize your Venture, adjusting the wheelbase lets the tires fit in the wheel openings, which helps the truck look perfectly scale. Full-time 4WD 1/10 scale off-road truck kit - you build yourself! All HPI Racing build-it-yourself kits include a completely detailed multi-language step by step build guide. Exploded diagrams and extensive information about your Venture ensures that you have the know-how when it comes to maintaining and upgrading your kit. You can also download a digital version of the manual to your personal electronic device and keep it with you for easy reference on the go. Brighten up your RC workspace with a FREE poster featuring the Venture! Just 'click here' to download it, then print it out or use it as your tablet or computer wallpaper! The best part about scale RC is making your Venture SBK reflect your own personality! Customize your Venture with a huge range of 3rd party options such as the lights, winches and other parts shown in the picture above. 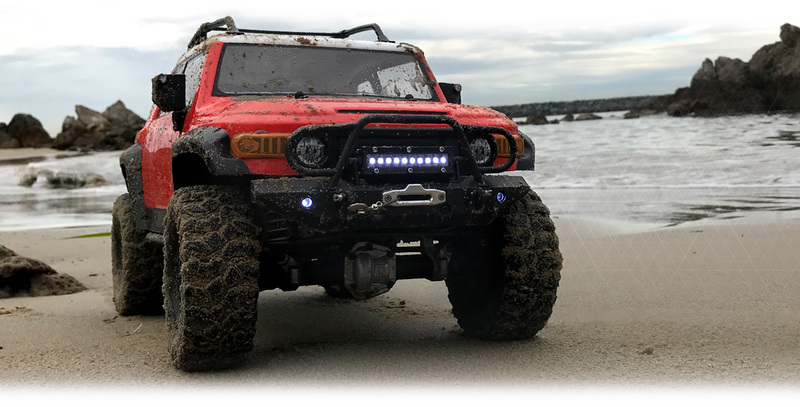 The #117365 clear FJ Cruiser body is also available separately, so you can go all-out to customize your Venture - that's what scale RC is all about! Any other 1/10th scale scaler-style body will fit as well, thanks to the adjustable wheelbase and body posts, and the large braces for the rear body posts work great for tall SUV style bodies. Add extra suspension flex and strength to your Venture scale crawler with the official Option 4-Link Set! The set includes a pair of anodized aluminum upper links for the rear end of the Venture, plus steel grub screws, plastic rod ends and mounting hardware including the axle mounts. 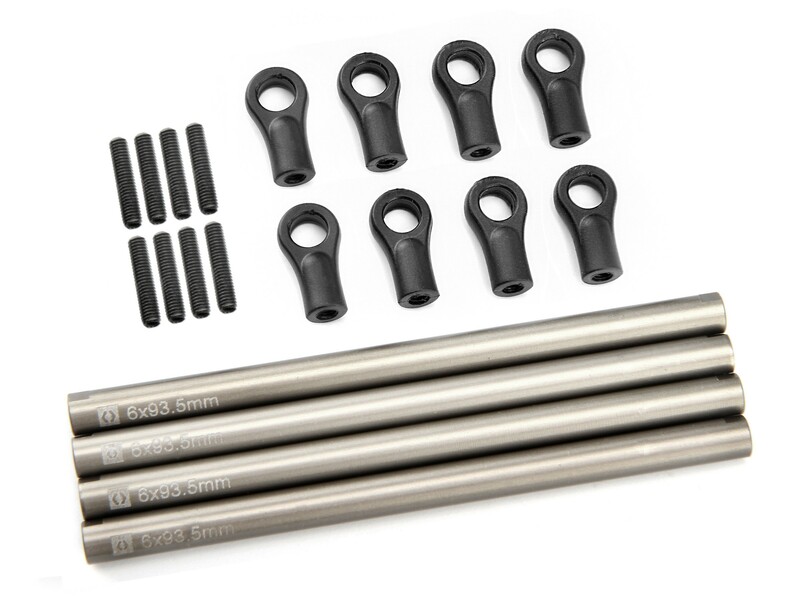 Stiffen up the links on your Venture with this set of Aluminum Lower Links, machined to the perfect length for the standard 213mm wheelbase. Four anodized aluminum links are included, as well as 2 steel grub screws and 2 plastic rod ends for each link (8 grub screws and 3 rod end in total). Each link is laser-engraved with the HPI logo. 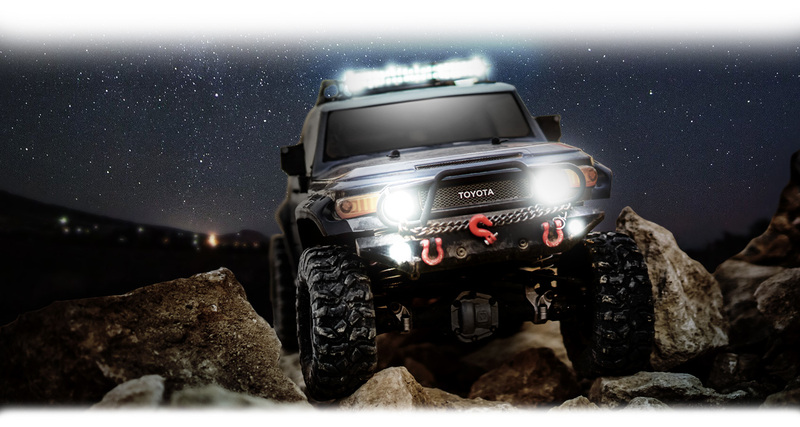 This heavy duty plastic Front Bumper will not only protect your crawler as you tackle the toughest of terrain, it features a removable grille guard and two functional tow links that gives an authentic scale appearance. The Front Bumper also uses an adjustable length mount that allows you fit multiple body styles. This heavy duty plastic Rear Bumper will not only protect your crawler as you tackle the toughest of terrain, it features a swing arm spare wheel carrier and two functional tow links that gives an authentic scale appearance. The Rear Bumper also uses an adjustable length mount that allows you fit multiple body styles.